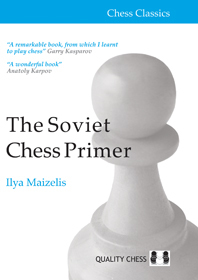 Ilya Maizelis�s masterpiece is the definitive introduction to the game of chess. It has inspired generations of Russians to take up the game, including arguably the two greatest players of all time, the 12th and 13th World Champions. In the original Russian, this landmark work is simply called �Chess� � no other explanation was considered necessary. The Soviet Chess Primer is a modern English translation of Maizelis�s witty introduction to the royal game. This new edition of a timeless classic includes an original foreword from the 2nd World Champion, Emanuel Lasker, as well as an introduction from the most celebrated chess trainer of modern times, Mark Dvoretsky.